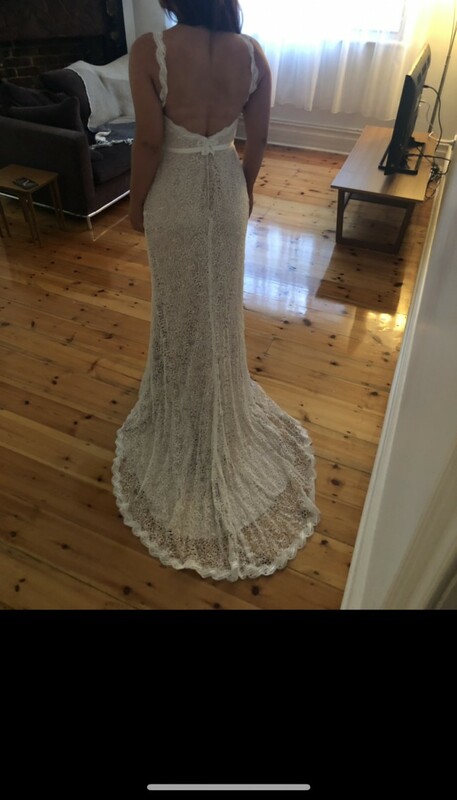 Gorgeous dress purchased late Nov 2017 and never worn. Dress has a hidden zip with button detailing. Delicate lace detailing on the bust which softens the whole dress. Very comfortable to move in. An additional $350 worth of alterations have been made to the dress. It has been shortened (I am 168cm's and recommend flats or a small heel). I had the straps removed and then re-added as removable straps. I had cups and a bra strap added to the dress for extra security. Dress has also been fitted with a bustle (not pictured but can provide if required). Once you send a message, Caitlin can invite you to purchase the dress.